Flavius Aetius (/ˈfleɪviəs eɪˈiːʃiəs/; Latin: Flavius Aetius [flaːwius a.etius]; 391–454), dux et patricius, commonly called simply Aetius or Aëtius, was a Roman general of the closing period of the Western Roman Empire. He was an able military commander and the most influential man in the Western Roman Empire for two decades (433–454). He managed policy in regard to the attacks of barbarian federates settled throughout the Western Roman Empire. Notably, he mustered a large Roman and allied (foederati) army to stop the Huns in the Battle of the Catalaunian Plains, ending the devastating Hunnic invasion of Attila in 451. He has often been called "the last of the Romans". Edward Gibbon refers to him as "the man universally celebrated as the terror of Barbarians and the support of the Republic" for his alleged victory at the Catalaunian Plains. Aetius was born at Durostorum in Moesia Secunda (modern Silistra, Bulgaria), around 391. His father, Flavius Gaudentius, was a Roman general and described as a native of the Roman province of Scythia, although some have interpreted this as a topos and used to describe a Gothic origin. Aetius' mother, whose name is unknown, was a wealthy aristocratic woman of Italian ancestry. Before 425 Aetius married the daughter of Carpilio, who gave him a son, also named Carpilio. Later he married Pelagia, widow of Bonifacius, from whom he had a son, Gaudentius. It is possible that he had also a daughter, whose husband, Thraustila, avenged Aetius' death by killing emperor Valentinian III. As a boy, Aetius was at the service of the imperial court, enrolled in the military unit of the Protectores Domestici and then elevated to the position of tribunus praetorianus partis militaris, setting him up for future political eligibility. Between 405 and 408 he was kept as hostage at the court of Alaric I, king of the Visigoths. In 408 Alaric asked to keep Aetius as a hostage, but was refused, as Aetius was sent to the court of Uldin, king of the Huns, where he would stay throughout much of the reign of Charaton, Uldin's successor. According to some early historians, Aetius's upbringing amongst militaristic peoples gave him a martial vigour not common in Roman generals of the time. In 423 the Western Emperor Honorius died. The most influential man in the West, Castinus, chose as his successor Joannes, a high-ranking officer. Joannes was not part of the Theodosian dynasty and he did not receive the recognition of the eastern court. 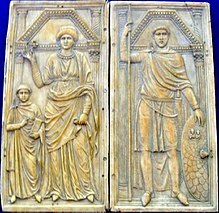 The Eastern Emperor Theodosius II organised a military expedition westward, led by Ardaburius and his son Aspar, to put his cousin, the young Valentinian III (who was a nephew of Honorius), on the western throne. Aetius entered the service of the usurper as cura palatii and was sent by Joannes to ask the Huns for assistance. Joannes lacked a strong army and fortified himself in his capital, Ravenna, where he was killed in the summer of 425. Shortly afterwards, Aetius returned to Italy with a large force of Huns to find that power in the west was now in the hands of Valentinian III and his mother Galla Placidia. After fighting against Aspar's army, Aetius managed to compromise with Galla Placidia. He sent back his army of Huns and in return obtained the rank of comes et magister militum per Gallias, the commander in chief of the Roman army in Gaul. In 426, Aetius arrived in southern Gaul and took command of the field army. At that time Arelate, an important city in Narbonensis near the mouth of the Rhone, was under siege from the Visigoths, led by their king Theodoric I. Aetius defeated Theodoric, lifted the siege of Arelate, and drove the Visigoths back to their holdings in Aquitania. In 428 he fought the Salian Franks, defeating their king Chlodio and recovering some territory they had occupied along the Rhine. In 429 he was elevated to the rank of magister militum; this was probably the iunior of the two offices of comes et magister utriusque militiae, as the senior is known to have been the patrician Flavius Constantinus Felix, the most influential man in those years, and a supporter of Galla Placidia. In 430 the Visigoths led by Anaolsus attacked Arelate again but were defeated by Aetius. In May 430, Aetius and the Army accused Felix of plotting against him and had him, his wife, and a deacon killed. Once Felix was dead, Aetius was the highest ranking amongst the magistri militiae, even if he had not yet been granted the title of patricius or the senior command. During late 430s and 431 Aetius was in Raetia and Noricum, defeating the Bacaudae in Augusta Vindelicorum, re-establishing Roman rule on the Danube frontier, and campaigning against the Juthungi. In 431 he returned to Gaul, where he received Hydatius, bishop of Aquae Flaviae, who complained about the attacks of the Suebes. Aetius then defeated the Franks, recapturing Tournacum and Cambriacum. He then sent Hydatius back to the Suebes in Hispania. Coin of Bonifacius Comes Africae (422-431 CE). While Aetius was campaigning in Gaul, there was an ongoing power struggle among Aetius, Felix, Bonifacius, and the emperor Valentinian's mother and regent Galla Placidia. In 427 while Bonifacius was away as governor (comes) of Africa, Felix caused him to fall into disfavour with Placidia. Bonifacius was eventually returned to favor by Placidia, but only after Felix had sent Sigisvult and two other armies against him when Aetius warned him of Felix's intentions. In 429, the Vandals exploited this power struggle and crossed over to Africa. After the execution of Felix in 430, Aetius and Bonifacius remained as the empire's most influential generals, both constantly vying for the favor of Placidia. In 432 Aetius held the consulate, but Bonifacius was recalled to Italy and received warmly by Placidia. Bonifacius was given the rank of patrician and made the senior comes et magister utriusque militiae, while Aetius was stripped of his military command. Aetius, believing his fall now imminent, marched against Bonifacius and fought him at the Battle of Rimini. Bonifacius won the battle but was mortally wounded, dying a few months later. Aetius escaped to Pannonia and traveled to the court of his friend, Rua, the king of the Huns. With their help he returned to power, receiving the title of comes et magister utriusque militiae. Aetius then had Bonifacius' son-in-law, Sebastianus, who had succeeded Bonifacius as magister militum, exiled from Italy to Constantinople, bought the properties of Bonifacius, and married his widow Pelagia. The Monza Cathedral Diptych, which may have been commissioned on Aetius' first consulship. It may also depict Stilicho. From 433 to 450, Aetius was the dominant personality in the Western Empire, obtaining the rank of magnificus vir parens patriusque noster (5 September 435) and playing the role of "protector" of Galla Placidia and Valentinian III while the Emperor was still young. At the same time he continued to devote attention to Gaul. In 436, the Burgundians of King Gundacar were defeated and obliged to accept peace by Aetius and Avitus; however, the following year he sent Hunnic foederati to destroy them. Allegedly 20,000 Burgundians were killed in a slaughter which probably became the basis of the Nibelungenlied, a German epic. That same year Aetius was probably in Armorica with Litorius to suppress a rebellion of the Bacaudae under a certain Tibatto. The year 437 saw his second consulship and the wedding of Valentinian and Licinia Eudoxia in Constantinople; it is probable that Aetius attended the ceremony that marked the beginning of the direct rule of the Emperor. At that time his general Litorius had broken the siege of Narbona and had turned the war in favor of the Romans. The following two years were occupied by a campaign against the Suebi and by the war against the Visigoths; in 438 Aetius won a major battle (probably the Battle of Mons Colubrarius), but in 439 the Visigoths defeated and killed Litorius and his Hunnic Foederati. Aetius returned to Gaul after Vetericus had stabilized the situation, and defeated the Visigoths and obtained a treaty. On his return to Italy, he was honoured by a statue erected by the Senate and the People of Rome by order of the Emperor; this was probably the occasion for the panegyric written by Merobaudes. In 443, Aetius settled the remaining Burgundians in Sapaudia, south of Lake Geneva. His most pressing concern in the 440s was with problems in Gaul and Iberia, mainly with the Bacaudae. He settled the Alans around Valence in 440 and along the Loire including Aurelianum in 442 to contain unrest in Armorica. In Spain, Aetius was slowly losing his grip on the situation. In 441 he appointed Asturius Magister Militum per Hispanias, in order to put down the Bacaudae in Tarraconensis. He was recalled and Merobaudes defeated the Bacaudae of Aracellitanus in 443. In 445 the Romans had the Vandals attack Turonium in Gallaecia, followed by Vitus who campaigned with a combined force of Romans and Goths in 446, but was ultimately defeated. The Bacaudae in Armorica revolted again in 447 or 448, and were put down by the Alans of Goar. As a result, the leader of the revolt Eudoxius fled to the court of Attila the Hun. In 449 the Bacaudae in Spain revolted and sacked Tyriasso, Caesaragusta, and Illerdensus. The Suebi also entered Tarraconensis to assist Basilius and his revolt. In 445 Majorian defeated a Frankish siege of Turonum, which was followed by a Frankish attack under Clodio in the region of Atrebatum, in Belgica Secunda. The foederati were stopped in an ambush near Vicus Helena, where Aetius directed the operations while his commander Majorian (later Emperor) fought with the cavalry. However, by 450 Aetius had already returned to good terms with the Franks. In 449 Chlodio died, and the patricius supported his younger son Merovaeus's claim to the throne. Aetius adopted him as his own son and sent him from Rome, where he had been an ambassador, to the Frankish court with many presents. Before 449 Aetius had signed an agreement with the Huns, allowing some of them to settle in Pannonia, along the Sava River; he also sent to Attila, the king of the Huns, a man called Constantius as a secretary. In 449, Attila was angry over an alleged theft of a golden plate, and Aetius sent him an embassy under Romulus to calm him; Attila sent him a dwarf, Zerco, as a present, whom Aetius gave back to his original owner, Aspar. However, the good terms between Romans and Huns did not last, as Attila wanted to attack Gaul; he knew that Aetius was a serious obstacle to his enterprise, and tried to have him removed, but in 451, when the Huns attacked, Aetius was still the commander of the Roman army in Gaul. The large Hunno-German army captured several cities, and proceeded towards Aurelianum. Aetius, with the help of the influential Gallo-Roman senator Avitus, convinced the Visigoths of king Theodoric I to join him against the external menace; he also succeeded in persuading Sambida (who was falsely accused of planning to join the Huns), the Armoricans, the Salian Franks, some of the Saxons, and the Burgundians of Sapaudia to join his forces. Then the joint Roman and Visigothic army moved to relieve the besieged city of Aurelianum, forcing the Huns to abandon the siege and retreat to open country. On June 20, 451 Aetius and Theodoric engaged Attila and his allies at the Battle of the Catalaunian Plains. Theodoric died in the battle, and Aetius suggested his son Thorismund retreat to Tolosa to secure his throne, and persuaded Merovaeus to return to the lands of the Franks; for this reason it is said that Aetius kept all of the battlefield loot for his army. Attila returned in 452 to again press his claim of marriage to Honoria; Aetius was unable to block Attila's advance through the Julian Alps. Instead, he chose to garrison Aquileia against Attila's onslaught. Attila invaded and ravaged Italy, sacking numerous cities and razing Aquileia completely, allegedly leaving no trace of it behind. Valentinian III fled from the court at Ravenna to Rome; Aetius remained in the field but lacked the strength to offer battle, instead positioning his army at Bononia to block the roads through the Apennines to Ravenna and Rome. Edward Gibbon however says Aetius never showed his greatness more clearly in managing to harass and slow Attila's advance with only a shadow force. Attila finally halted at the Po, where he met an embassy including the prefect Trygetius, the ex-consul Gennadius Avienus, and Pope Leo I. After the meeting he turned his army back, having gained neither Honoria's hand nor the territories he desired. Ancient and medieval historians tended to give Pope Leo and supernatural forces credit for halting Attila, but a number of practical factors may have also induced Attila to retreat: his army was unable to obtain sufficient food and was suffering from disease, Aetius' army was busy harassing the Huns, and finally Marcian had sent forces north of the Danube to attack the homelands of the Huns and their vassals under a separate Aetius. Although in 453 Aetius had been able to betroth his son Gaudentius to Valentinian's daughter Placidia, Valentinian felt intimidated by Aetius, who had once supported Joannes against him and who, Valentinian believed, wanted to place his son upon the imperial throne. The Roman senator Petronius Maximus and the chamberlain Heraclius were therefore able to enlist Valentinian in a plot to assassinate Aetius. The ancient historian Priscus of Panium reports that on September 21, 454, while Aetius was at court in Ravenna delivering a financial account, Valentinian suddenly leaped from his seat and declared that he would no longer be the victim of Aetius's drunken depravities. He held Aetius responsible for the empire's troubles and accused him of trying to steal the empire from him. When Aetius attempted to defend himself from the charges, Valentinian drew his sword and together with Heraclius, struck Aetius on the head, killing him. Later, when Valentinian boasted that he had done well in disposing of Aetius, someone at court responded, "Whether well or not, I do not know. But know that you have cut off your right hand with your left." Edward Gibbon credits Sidonius Apollinaris with this famous observation. Maximus expected to be made patrician in place of Aetius, but was blocked by Heraclius. Seeking revenge, Maximus arranged with two Hun friends of Aetius, Optila and Thraustila, to assassinate both Valentinian III and Heraclius. On March 16, 455, Optila stabbed the emperor in the temple as he dismounted in the Campus Martius and prepared for a session of archery practice. As the stunned emperor turned to see who had struck him, Optila finished him off with another thrust of his blade. Meanwhile, Thraustila stepped forward and killed Heraclius. Most of the soldiers standing close by had been faithful followers of Aetius, and none lifted a hand to save the emperor. [Attila's] retreat across the Rhine confessed the last victory which was achieved in the name of the Western Roman Empire.". Certainly Aetius' military legacy is defined by Châlons, even though he effectively ruled the western empire from 433–454, and attempted to stabilize its European borders under a deluge of barbarians, including foremost, Attila and the Huns. 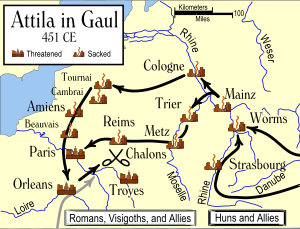 After he secured the Rhine, Attila moved into central Gaul and put Orléans under siege. Had he gained his objective, he would have been in a strong position to subdue the Visigoths in Aquitaine, but Aetius had put together a formidable coalition against the Hun. The Roman leader had built a powerful alliance of Visigoths, Alans and Burgundians, uniting them with their traditional enemy, the Romans, for the defense of Gaul. Even though all parties to the protection of the Western Roman Empire had a common hatred of the Huns, it was still a remarkable achievement on Aetius' part to have drawn them into an effective military relationship. While J. B. Bury viewed Aetius as a great military commander, and giant figure of history, he did not consider the battle itself to be particularly decisive. He argues that Aetius attacked the Huns when they were already retreating from Orléans (so the danger to Gaul was departing anyway); and he declined to renew the attack on the Huns next day, precisely in order to preserve the balance of power. (Others suggest that the Huns may have abandoned the siege of Orléans because Aetius's armies were advancing on them.) Bury suggests that the German victory over the Huns at the Battle of Nedao, three years later, was more important. This determined that there would be no long-term Hunnic Empire in Europe, which Bury thinks would have been unlikely even if they had crushed the Germans on that occasion. For Bury, the result of the battle of the Catalaunian Plains determined chiefly that Attila spent his last year looting Italy, rather than Gaul. Modern authors typically overlook the battle and focus on the greater impact of Aetius' career, and he is generally seen as one of the greatest Roman military commanders of all time, as well as an excellent diplomat and administrator. Meghan McEvoy states that the Battle of the Catalaunian Plains is more a testament to his political aptitude than his military skill due to his foresight in the ability to provision treaties and obligations. John Julius Norwich caustically referred to the assassination of Valentinian III by his own guards as an act that Valentinian brought on himself by his foolish execution of Aetius, the "Empire's greatest commander." Hugh Elton notes that Aetius and his army were one of the most effective Roman armies to have existed, with its speed and mobility pointing to a highly efficient logistical and manpower resupply system not directly evidenced by the sources. It is generally seen that the rapid fragmentation and collapse of the West after his death was a testament to his ability to hold the empire together. "Stilicho and Aetius, who certainly knew each other, although they were from different generations, were responding to the specific, and vastly different, problems with which they were faced. Neither could find all of the answers." Still, the loss of the Empire's tax base in North Africa remains a black mark on his career in the eyes of many modern historians. Aetius is generally considered to be the Roman consul to whom the Groans of the Britons was addressed, sometime between 447 and 454 AD. This request for military aid can be viewed as a preamble to the thousand year literary cycle, which evolved the island's legendary Arthurian heritage, the most significant part of what is now collectively referred to as the Matter of Britain. Aetius is the antagonist in a scenario named "Battle of the Catalaunian Fields" in the "Attila the Hun" campaign of the game Age of Empires II: The Conquerors. Aetius is the protagonist of several operas titled Ezio (Italian for Aetius), as well as Verdi's opera Attila. Aetius is protagonist of two biographical novels by polish historical writer Teodor Parnicki: Aecjusz, ostatni Rzymianin (1937, title means Aetius, The Last Roman) and Śmierć Aecjusza (1966, title means The Death of Aetius). Both novels are ambivalent portraits of Flavius Aetius, and the complicated Roman history during the barbarian invasions of the fifth century. In the 1954 film Attila Aetius is played by Henri Vidal, as an honest soldier reluctantly serving the corrupt Roman court. The character dies in his climactic battle with the Huns. Aetius is played by Powers Boothe in the 2001 American TV Miniseries Attila. Here he is portrayed as an antagonist whose methods are contrasted with Attila, a former mentor and friend to Attila who becomes his nemesis. At the same time, he is depicted as the only general capable of keeping the empire standing and facing Attila as an equal. Aetius is portrayed as the heroic 'Last of the Romans' in William Napier's Attila trilogy (2005), uniting the Romans and the Goths in one final, titanic battle to stop the Huns in their tracks, in the epochal Battle of the Catalaunian Fields. While he does not appear in person, Aetius' battle with Attila is documented in detail in Jack Whyte's book The Eagle, during a conversation between King Arthur and Seur Clothar. Aetius, Galla Placidia and Stilicho all appear as central characters in Jose Gomez-Rivera's historical novel Flavius Aetius: The Last Conqueror, published in 2004. Aetius, Attila and Theodoric all appear in Michael Curtis Ford's fourth novel entitled The Sword of Attila, published by Thomas Dunne Books in 2005. Aetius, Attila, Honoria, Leo and others figure in Louis de Wohl's vivid historical novel Throne of the World (1946), later republished with the alternative title Attila the Hun. Aetius is an important supporting character in Thomas B. Costain's 1959 novel The Darkness and the Dawn, as are Attila and Valentinian III. The novel also includes an account of the Battle of the Catalaunian Plains. The movie 476 A.D. Chapter One: The Last Light of Aries, about the period of Flavius Aetius and his victory over Attila the Hun at the Battle of Châlons, as well as following the events leading to the End of the Roman Empire on September 4, 476 A.D, was released in 2014, by Ivan Pavletic. Aetius is portrayed by Michael Nardone in the final episode of the 2016 History Channel docudrama Barbarians Rising, set during the campaign against the Huns. ^ John Beckwith (1993) . Early Christian and Byzantine Art. Second Edition, new impression. New Haven and London: Yale University Press. ISBN 0-300-05296-0, pp 45-46. ^ The ae in Latin Aetius was disyllabic, not diphthongal. ^ Jones, Arnold Hugh Martin (1980). The Prosopography of the Later Roman Empire: Volume 2, AD 395-527. Cambridge University Press. p. 493. ISBN 978-0-521-20159-9. ^ Gregory of Tours, ii.8; Priscus, fr. 8; Cassiodorus, Variae, i.4.11; John of Antioch, fr. 201.3 and 204; Marcellinus comes, s.a. 432; Sidonius Apollinaris, Carmina, v.205; Hydatius, 167; Merobaudes, Carmina, iv (poem composed for the first birthday of Gaudentius); Additamenta ad chron. Prosperi Hauniensis, s.a. 455 (only source to cite Thraustila as son-in-law of Aetius). Cited in Jones, p. 21. ^ Hughes, Aetius: Attila's Nemesis, 26-27. ^ Cassiodorus, Chronica, s.a. 425; Gregory of Tours, ii.8; Philostorgius, xii.4; Prosp. s.a. 425; Chronica gallica 452, 100; Jordanes, Romana, 328; Jones, p. 22; Hughes, Aetius: Attila's Nemesis, 31-33. ^ Philostorgius, xii.4; Prosp. s.a. 425 and 428; Chronica Gallia 452, 102 (s.a. 427); Cassiodorus, Chronica, s.a. 428. Cited in Jones, p. 22. ^ Prosperus of Tirus, s.a. 429 e 430; John of Antioch, fr. 201; Hydatius, 92, 93 and 94 (s.a. 430), 95 and 96 (s.a. 431), 98 (s.a. 432); Chronica Gallia 452, 106 (s.a. 430); Jordanes, Getica, 176; Sidonius Apollinaris, Carmina, vii.233. Cited in Jones, pp. 22-23. ^ Hughes, Aetius: Attila's Nemesis, pp. 102-103. ^ Annales Ravennates, s.a. 435; John of Antioch, fr. 201.3; Prosper of Aquitaine, s.a. 435, s.a. 438, s.a. 439; Cassiodorus, Chronica, s.a. 435; Chronica Gallica a. 452, 117 (s.a. 435), 118 (s.a. 436), 119 (s.a. 437), 123 (s.a. 439); Hydatius, 108 (s.a. 436), 110 (s.a. 437), 112 (s.a. 438), 117 (s.a. 439); Sidonius Apollinaris, vii.234-235 and 297-309; Merobaudes, Panegyrici, i fr. iib 11ff, i fr. iia 22-23, and ii.5-7; Jordanes, Getica, 176; ; Barnes, Timothy, "Patricii under Valentinian III", Phoenix, 29, 1975, pp. 166-168; Jones, pp. 24-26. ^ Chronica Gallica Anno 452, 133 (s.a. 438); Sid. Apol. carm. 5.210-218. Cited in Jones, p. 27. Jan Willem Drijvers, Helena Augusta, BRILL, ISBN 90-04-09435-0, p. 12. ^ Chronica Gallica a. 452, 139 (s.a. 451), 141 (s.a. 452); Cassiodorus, Chronica, 451; Additamenta ad chron. Prosperi Hauniensis, s.a. 451; Hydatius, 150 (a. 451); Chronicon Paschale, s.a. 450; Jordanes, Getica, 197ff; Gregory of Tours, ii.7; Procopius, i.4.24; John Malalas, 359; Theophanes, AM 5943. Cited in Jones, p. 27. ^ Gregory of Tours, 2.7; Jordanes, Getica, 215ff. Cited in Jones, pp. 27-28. ^ Prosper, s.a. 452; Jordanes, De Origine Actibusque Getarum 42.219. ^ Hughes, Aetius: Attila's Nemesis, 180. ^ Edward Shepherd Creasy http://www.standin.se/fifteen06a.htm Fifteen Decisive Battles of the World "The victory which the Roman general, Aetius, with his Gothic allies, had then gained over the Huns, was the last victory of imperial Rome. But among the long Fasti of her triumphs, few can be found that, for their importance and ultimate benefit to mankind, are comparable with this expiring effort of her arms." ^ Edward Gibbon, Decline and Fall of the Roman Empire, The Modern Library, New York, volume II, p.1089. ^ McEvoy, Meghan (2013). Child Emperor Rule in the Late Roman West AD 367-455. Oxford: Oxford University Press. pp. 294–295. ^ Elton, Hugh (1992). "Defence in Fifth Century Gaul". Fifth Century Gaul: A Crisis of Identity? : 142. ^ Hughes, Ian (2012). Aetius: Attila's Nemesis. Barnsley: Pen & Sword Military. p. 205. ^ Hughes, Ian (2012). Aetius: Attila's Nemesis. Barnsley: Pen & Sword Military. pp. 66–73, 83–84, 118–119. ^ Heather, Peter (2006). The Fall of the Roman Empire: A New History of Rome and the Barbarians. Oxford: Oxford University Press. pp. 291–292. ^ Halsall, Guy (2007). Barbarian Migrations and the Roman West. Cambridge: Cambridge University Press. pp. 250, 254–255. ^ Hughes, Ian (2012). Aetius: Attila's Nemesis. Barnsley: Pen & Sword Military. p. 201. Gregory of Tours, Historia Francorum ii.8, gives a condensed version of Aetius' character and career, using a lost history of Renatus Profuturus Frigeridus. Cameron, Averil. 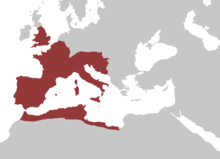 The Later Roman Empire. Harvard University Press, 2007. ISBN 0-674-51194-8. Cameron, Averil. The Cambridge Ancient History: The Late Empire. Cambridge University Press, 1998. ISBN 0-521-30200-5. Clover, Frank M. "Flavius Merobaudes: A Translation and Historical Commentary." Transactions of the American Philosophical Society 61.1: (1971). Drinkwater, John. Fifth-Century Gaul: A Crisis of Identity? Cambridge University Press, 1992. ISBN 0-521-41485-7. Elton, Hugh. Warfare in Roman Europe, AD 350-425. Oxford University Press, 1998. ISBN 0-19-815241-8. Ferrill, Arther. " The Fall of the Roman Empire: The Military Explanation ." London: Thames and Hudson, 1986. Hughes, Ian. "Aetius: Attila's Nemesis." Pen & Sword, 2012. ISBN 1848842791. Jones, A.H.M. The Later Roman Empire 284-602. Oxford Press, Cambridge, 1964. Jones, Arnold Hugh Martin, Martindale, John Robert, and Morris, John. "Fl. Aetius 7." The Prosopography of the Later Roman Empire, Vol. 2. Cambridge University Press, 1980, ISBN 0-521-20159-4, pp. 21–29. McEvoy, Meghan. Child Emperor Rule in the Late Roman West, AD 367-455. Oxford University Press, 2013. Norwich, John J. Byzantium: The Early Centuries: The Fall of the West. Knopf, New York, 1997. O'Flynn, John Michael. Generalissimos of the Western Roman Empire. The University of Alberta Press, 1983. ISBN 0-88864-031-5. Oost, Stewart I. Galla Placidia Augusta. Chicago University Press, 1968. Tackholm, Ulf. "Aetius and the Battle on the Catalaunian Fields." Opuscula Romana 7.15: (1969).